UAE-based artists Jeff Scofield and Stephanie Neville have explored various aspects of the transient lifestyle in the UAE in a joint exhibition titled, Woven Identities. The artists have used found objects and everyday materials like fabric, threads and paper to create installations that examine issues such as the connections that bind us together in a community that is transient and in constant flux; how we adapt to our immediate environment; and how the transient lifestyle in the UAE affects the sustainability of interdependent relationships, and personal identities. The artworks reflect the fabric of society, with the warp and weft of individual threads coming together to create something strong, yet malleable and adaptable. American artist, Scofield, is known for upcycling found objects and everyday materials to create kinetic installations that explore sustainable themes and evoke the complexities and contradictions of modern life. In a large-scale installation, Money Cascade, he has strung together currency notes from different countries to represent the many nationalities that live in the UAE, and the country’s status as an international trading hub. Similarly, in ‘Conversations’ he has used over a thousand pages torn out from novels in various languages and scripts, to create a curtain-like installation. “Both these works represent the melting pot of cultures in the Middle East, that exist together but do not really melt. The notes and pages flutter in the ambient air currents, playing with the light, and emitting soft rustling sounds like whispers, evoking notions of lost stories, faded memories and the passage of time,” he says. In his Woven Books series, Scofield has torn out the pages from several hardcover novels, made drawings on them, cut them into strips and then woven them back into books, perhaps to reflect a multicultural society, and how migration and mingling with other cultures changes us. “The weaving process creates entirely new graphic patterns, like visual sequences not verbal narratives. The stories are lost forever, and are replaced with visual narratives instead,” the artist says. Neville, who is from South Africa, draws on her personal experiences to create conceptual works dealing with themes of gender, diaspora, absence, and self- acceptance. 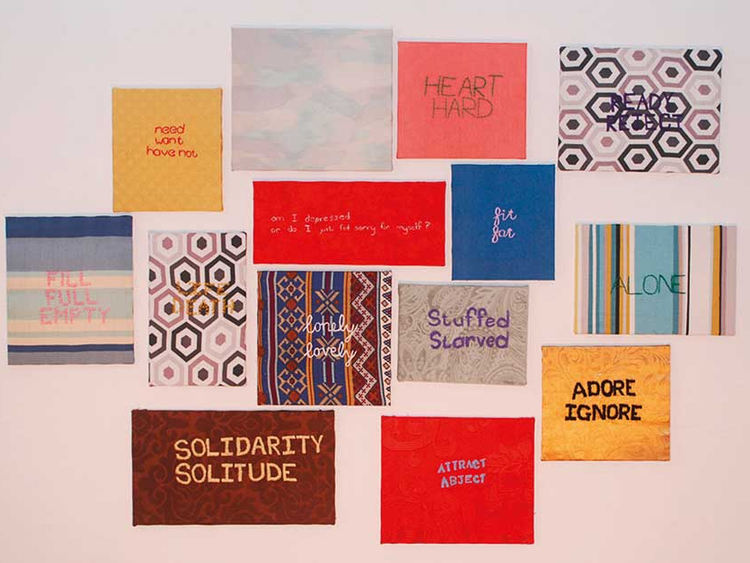 Her work ‘Sticks and Stones’, comprising contrasting sets of words embroidered on pieces of recycled fabrics, refers to the idiom ‘sticks and stones may break my bones, but words will never hurt me’. “The embroidered words and thoughts reflect emotional periods in my personal relationship, but everybody can identify with them. I collected the recycled fabrics from home décor tailors, so they refer to ‘home’, and the notion of being displaced from home. Arranged together, they symbolise a home away from home, and the differences between cultures, while bringing together these cultures through shared experiences,” she says. In another work, here not here, she has used textiles and threads to depict the fragility and tension in personal relationships due to the migrant working environment of the UAE. “This installation consists of hand- embroidered portraits, loose hanging threads and empty photo frames. The portraits represent obsessive thinking of an absent partner. I have added key words from traditional wedding vows as a reminder of the binding promises we make. I used water soluble stabiliser as the background for the embroidery which allows only the stitched thread to be preserved, signifying the isolation and disconnection between partners, while the residual, fraying thread relates to the loss of memory and the negligence of a relationship. Reminiscent of a domestic milieu, empty frames are placed on the wall capturing the shadows cast by the embroidered works, denoting the passing of time and echoing the sense of absence, loss and memory,” she says. Woven Identities will run at The Project Space, in the Arts Center, NYU Abu Dhabi until July 22.